Newtown Pentacle always has interesting posts, and interesting asides. Wednesday’s nail biting has some of both – well-researched before and after images of Newtown Creek, 1881 vs. today, and brief mention of something that I have been spending a lot of time looking at over the past few months in relation to the environmental legacy at Bushwick Inlet Park (BIP) – manufactured gas. In studying the potential environmental clean ups required for the future parcels of BIP, it turns out (not surprisingly) that these issues are deeply intertwined with the long-past industrial history of the sites. What is one day to become a 27-acre park, for close to two centuries, has been the site of intensive industrial activity. With all the recent talk of the pending sale of a portion of the promised parkland, either to the City of New York or to a private developer, the subject is especially timely. 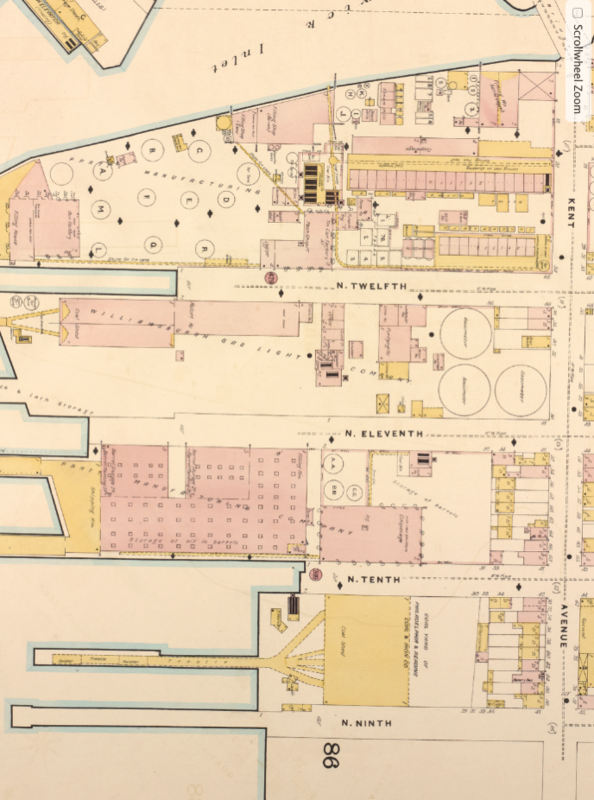 For the better part of a century, the three and a half northern blocks of the future BIP, from North 10th Street to Bushwick Inlet itself, had two primary industrial uses – manufacture of coal-tar gas and petroleum distillation and processing. The block between North 11th and North 12th Streets – half of which is owned by the City and the other half owned by CitiStorage – was the site of a manufactured gas plant from the 1850s through the 1940s. Throughout roughly the same time period, the blocks to the north and the south – the northern ones owned by the City, the southern one owned by CitiStorage – were home to Standard Oil’s Pratt Works, a massive petroleum distilling, storage and distribution operation. These blocks are in the middle of what will (hopefully) soon be Bushwick Inlet Park. But before it can become a park, there is a lot of environmental remediation that will need to happen. Some of that remediation is underway, some of it about to happen, and some awaiting acquisition of the final pieces of property. Bushwick Inlet Park was mapped as part of the 2005 Greenpoint-Williamsburg Waterfront Rezoning. The rezoning transformed close to 200 blocks in Greenpoint and Williamsburg from manufacturing zoning to residential zoning, kickstarting the north Brooklyn real estate boom. When completed, the Williamsburg and Greenpoint waterfront will be home to a couple dozen towers fronting on a shore public walkway connecting Newtown Creek to Northside Piers and the Austin Nichols building. In the middle of that shore public walkway will be Bushwick Inlet Park, a 27-acre regional park that was mandated as by the 2005 environmental impact statement (EIS) as mitigation for the adverse impact of all this new development on north Brooklyn’s already paltry open space. The park site consists of multiple properties, most of which have been acquired by the City. The only hold out at this point is the 7-acre CitiStorage site, which occupies a block and a half between North 10th and North 12th Streets. Monitor Museum – the northernmost site, this one-acre parcel sits on the northern side of Bushwick Inlet. It was formerly owned by Motiva Enterprises, a former subsidiary of Texaco that manufactured and marketed petroleum products. The property is across Quay Street from the Continental Iron Work, where the Civil War ironclad USS Monitor was built. This parcel was donated by Motiva to the Greenpoint Monitor Museum in 2004, and is slated to be developed as a permanent museum to USS Monitor. (The Monitor Museum property is not part of the NYC Parks development of Bushwick Inlet Park, but when completed it will be an important part of the waterfront experience connecting Greenpoint and Williamsburg.) Historically, this side of Bushwick Inlet was used for lumber storage and spar (mast) storage. Based on the history of use at the site, the Monitor site would appear to be relatively clean for a north Brooklyn waterfront site. Motiva site – adjacent to the Monitor site, this parcel wraps three sides of Bushwick Inlet. At some places, the parcel is only about 10′ deep. The property was acquired under the de Blasio administration in 2014. The southern part of the Motiva property abuts the Bayside site (below), a property that has a large potential environmental legacy to be addressed, while the northern part of the site appears to be similar in condition to the Monitor Museum site. burgh Gas Light Co. can be seen at the far right. Bayside site – This is where things start to get messy. The Bayside site is the northernmost park property in Williamsburg, sitting between North 12th Street and Bushwick Inlet. The property was the original home of Charles Pratt & Co.’s Astral Oil Works, dating back to the 1860s. The Pratt works initially refined kerosene, and was the source of Charles Pratt’s wealth and philanthropy, which included Pratt Institute and the Astral Apartments in Greenpoint, among other endeavors. In 1874, Charles Pratt & Co. and Astral Oil became part of John D. Rockefeller’s nascent Standard Oil Co., and in the process Charles Pratt and his partner Henry Rogers became two of America’s wealthiest men. 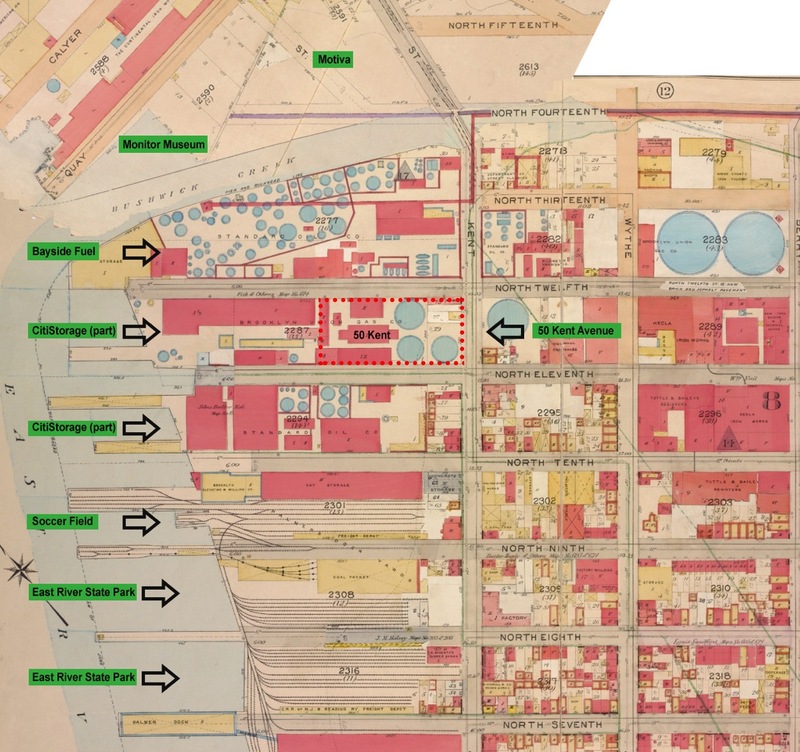 The Pratt Works at North 12th Street became part of Standard Oil’s empire, and operated as an oil refining and storage site under Standard Oil through the 1940s, and subsequently under other operators, most recently Bayside Fuel. The continuous petroleum storage operations ended this past Spring, when the City completed an acquisition of the property started under the Bloomberg administration. Now that the Bayside property has been acquired by the City and is officially New York City Park land, plans are underway for its clean up and conversion to open space. The City is still conducting studies to determine the extent of the contamination on the site, but with about 160 years in operation as a petroleum processing facility, that clean up is likely to be substantial. Williamsburgh Gas Light Co. – the block from North 11th to North 12th, Kent to the river, was historically the home of the Williamsburgh Gas Light Co., a manufactured gas plant that started operations at this property in the 1850s. The eastern part of the property – 50 Kent Avenue – was the location of three large gas storage tanks – gasometers – which are now the subject of a 9-year Superfund clean up operation to the tune of $22 million. This half of the block was acquired by the City in 2011, and for the past few years was used as the venue for the OSA summer concert series. In terms of environmental condition, this half of the block also yields the most information for the surrounding blocks, having been the subject of dozens of studies over the past two-plus decades. Manufactured gas – coal tar gas – was what lit urban America in the 19th century, before Edison and Tesla brought us electricity and light bulbs. Coal tar and coal tar gas were widely produced in many American cities from the 1850s through the early 1950s. The gas was originally produced by capturing the off-gassing from burned coal, and the process was a very local one – manufactured gas plants were located throughout New York City, usually on the waterfront, where access to large amounts of coal could be readily had. MGP gas storage tanks are typically the most heavily contaminated part of former MGP sites. The tanks, which were the end point in the coal-tar refinement process, stored the gas before it was delivered via pipes to houses, business and street lamps throughout the area (by the way – a fourth holder was located across Kent Avenue, at what is now the site of an office building). The primary source of contamination in the gasometers was residual coal tar, which would sink to the bottom of the tanks and absorb into the ground. 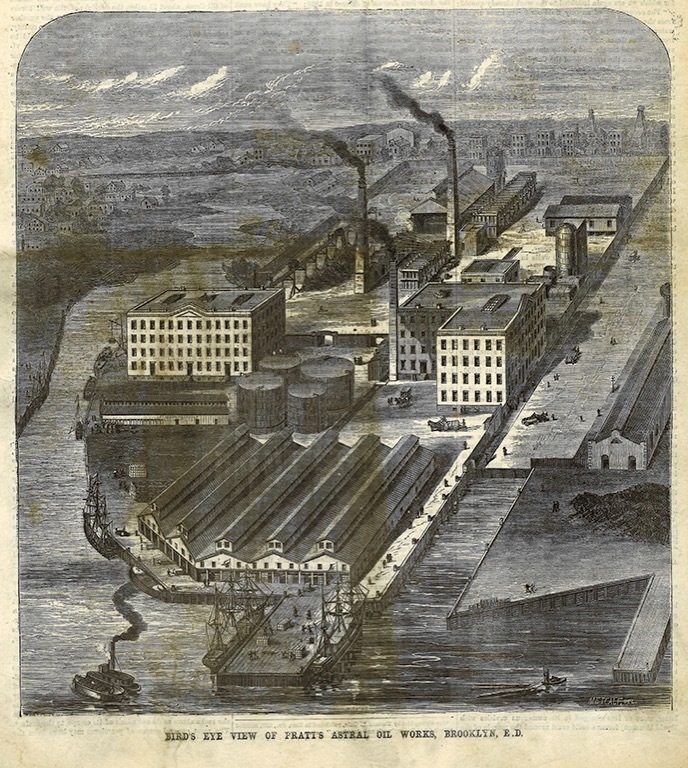 Due to the subsurface construction of the gasometers, which was typically masonry, there was ample opportunity for seepage of the coal tar residue into the soil. Coal-tar plumes can extend directly down many tens of feet, and extend outward from the tank area. Investigations conducted as part of the 50 Kent cleanup operation [PDF] show that “petroleum contamination co-mingled with coal tar contamination” was found as deep as 50′ below ground, and as far away as the sediment in the East River, more than a block to the west. Other reports available through National Grid’s community portal for the clean up indicate that “dense non-aqueous phase liquid (DNAPL) tar impacts” have migrated off site”. The high water table on the waterfront may increase the opportunity for lateral movement of coal tar. Remediation of this portion of the site includes excavation and backfilling with clean fill the tank areas to a depth of 25′ to 30′, and extraction and backfilling with clean fill the remaining area to a depth of 5′. The western half of the gas works block housed part of the CitiStorage document storage facility. This building burned down in a spectacular conflagration in January 2015 (interestingly, that may not have been the most disastrous fire at Bushwick Inlet Park). 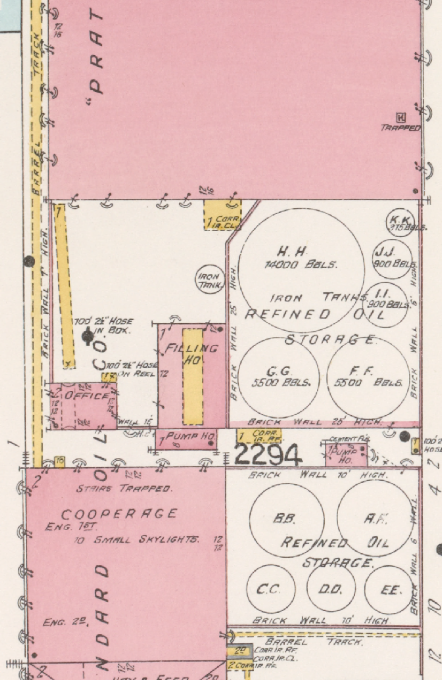 The CitStorage portion of the block was also historically part of the Williamsburgh Gas Light Co. operations, housing the coal sheds, the retort house and the purifying house. 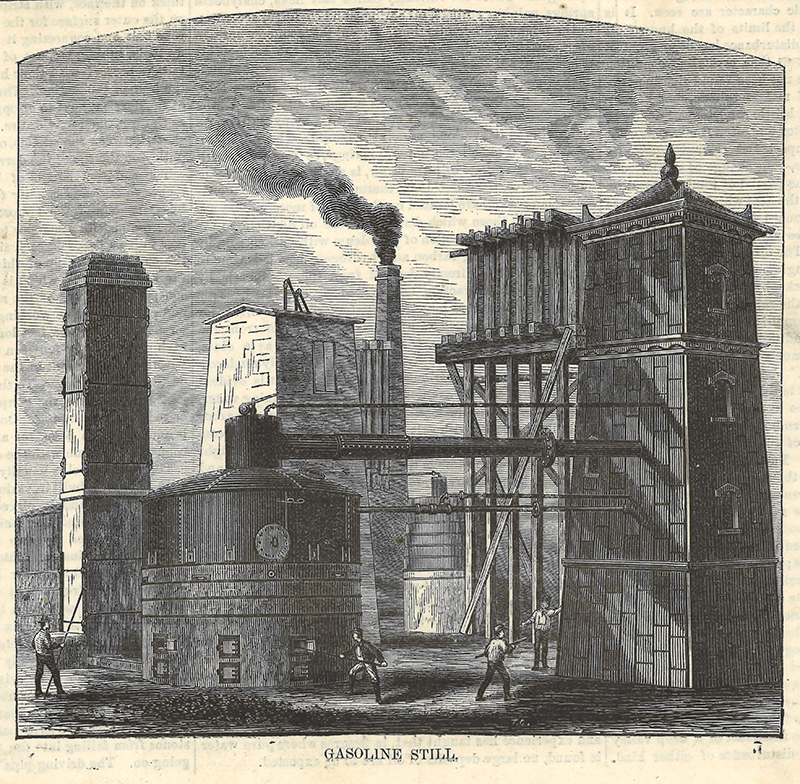 The retorts – large furnaces – were where coal feedstock was burned and resulting gases were captured for storage and distribution. The purifying house consisted of a series of tanks to capture sulphur and coal residuals from the manufacturing process. The waste from purifying houses was often disposed of onsite, and along with coal tar residue underneath gasometers, this purifying waste is a primary target in MGP clean up operations. While the environmental condition of the eastern half of the gas works block is well known, no public documents are available to show what contamination might exist directly on the western, CitiStorage, portion of the property. Various site investigations over the past 25 years [PDF] have indicated high levels of contamination on all four sides of the CitiStorage property. These include VOCs, SVOCs and other contaminants related to the MGP operations on this block and to “historical petroleum releases from the former distilling and storage operations” on the blocks to the north and the south. CitiStorage site – the block between North 10th and North 11th Street houses the remaining CitiStorage document storage facility, a full-block metal-clad building. This parcel, and the western half block of the gas works site, are the subject of an ongoing battle by neighborhood activists to force the City to complete the acquisition of the properties for Bushwick Inlet Park. Prior to CitiStorage’s occupancy and going back to the 1940s, the block was part of Brooklyn Eastern District Terminal (BEDT), a freight railway system that served north Williamsburg. Before BEDT, the block was home to the second half of Standard Oil’s Pratt Works. This facility, operated by Pratt as early as 1868, was used to process, store and package kerosene and other petroleum products for distribution. As many as a dozen tanks, ranging in size from 400 barrels to 14,000 barrels (roughly 17,000 to 600,000 gallons) occupied the center portion of the site. Packing and printing facilities were located to the west, and stables and offices to the east. Here too, there are no public documents available to indicate what environmental legacy may exist at the property. But the reports for 50 Kent make it pretty clear that there is contamination immediately adjacent to the property relating to both the petroleum distilling and storage operations on this block and to the MGP operations on the block to the north. Soccer Field site – The only built portion of Bushwick Inlet Park is the soccer field and community facility/parks headquarters on the block between North 9th and North 10th Streets. This block was part of BEDT for many years, housing hay storage and bulk flour storage and milling operations. Prior to BEDT, the block was home to Palmer’s Dock coal storage facilities. During the Palmer’s Dock era, the block was much shorter; sometime in the early 20th century, the block was doubled in size and extended into the East River. Unlike the blocks to the north, there does not appear to have been any heavy industrial operations or petroleum-related operations at this block. As a result, the clean up required for the construction of the existing park was much less than what is anticipated for sites like Bayside and 50 Kent. In all, the three blocks from North 10th Street to Bushwick Inlet are home to some of the most worrisome types of polluters when it comes to formerly industrial sites. Oil refining, oil storage and manufactured gas production were all intensive industrial operations that have left well-documented levels of contamination and sites across the country. The active clean up of 50 Kent Street is expected to be an 18-month process, completing in the Summer of 2017. But planning and studies to prepare for the clean up have been ongoing since at least 2006, so the entire process to clean up just this one half block will have taken more than a decade. The clean up of the the Pratt/Bayside property could also take years, as it requires investigation, planning, demolition of existing tank structures, and ultimately cleanup. The clean up of the two CitiStorage sites is the big question mark – the property owner has told community activists on numerous occasions that both sites have been tested and are clean as a whistle, but no tests have been released to the City or to the public, so this remains to be verified. Extensive testing conducted by Metcalfe & Eddy in 2006 as part of the investigation and planning for 50 Kent [PDF] showed high levels of VOCs, SVOCs and coal tar residue at various locations along North 10th and North 11th Street, immediately adjacent to CitiStorage properties. The M&E report attributes these contaminants to releases from the former Standard Oil distillery and storage operations between North 10th and North 11th Street as well as to the MGP site. The same report identified high levels of “petroleum contamination co-mingled with coal tar contamination” in sediment samples collected along the East River between North 10th and North 12th Streets, adjacent to the CitiStorage properties, which was attributed to the Standard Oil and Williamsburgh Gas Light Co.
Based on the many reports and investigations related to 50 Kent Avenue, it is clear that there is contamination related to both the MGP operations and the petroleum processing and storage operations of Standard Oil throughout the three and a half blocks from North 10th Street to Bushwick Inlet. Clean up and conversion of these properties to parkland and usable open space is very achievable, and ultimately, the parkland will be safe and usable, but it is a lengthy process. Clean up related to the gas works operations is subject to a consent decree, by which National Grid – the successor to Williamsburgh Gas Light Co. and Brooklyn Union Gas – is responsible for carrying out and paying for the clean up. But as far as I know, no such decree exists for the former Pratt Works sites of Standard Oil at Bayside and CitiStorage. The lack of such a legacy owner to foot the bill for clean up is believed to be the reason why the 8+ acre property sold for a relatively low sum. Unless the City can successfully litigate to draw in additional legacy polluters such as Exxon/Mobil, the cost of the clean up will be borne by the owner and buyer (the City of New York at Bayside). The City may be able to pursue Standard Oil or National Grid for the clean up costs, but that would presumably require a fair amount of legal fees and time. Would the same be true of CitiStorage’s former Standard Oil property? 1929 aerial view south towards Brooklyn Eastern District Terminal (BEDT). Oil storage tanks for Standard Oil’s Pratts Works can be seen in foreground.